The Art of Naming: Boy Names on a Girl? We have all heard of names that were originally masculine but slowly became taken over by the girls. Classic examples are Shannon, Kelly, Tracy, Stacy, Leslie, Ashley, Aubrey, Meredith, Dana, Caroll, Shirley, Shelby and so on. One of today's naming trends that I personally dislike is "boy names on girls" but I realize that this is not a new thing. Girls have been stealing names for decades! It is a wonder there are any legitimate boy names left! While there is nothing necessarily wrong with bending the gender rules, I think it only leads to confusion for children. Possible identity issues, and having to correct people who assume the wrong gender based on the written name, etc. I mean no disrespect to those of you who enjoy this phenomenon, but I personally like gender-specific names more than the gender-neutral names. That being said, I thought I would list some more modern examples of names that switched sides or can be considered a "gender-bender" in which both sexes use them equally. Click here for even more unisex names and see their boy-to-girl ratios! Perhaps certain sounds are just more acceptable on a girl. Vowels like A and E as well as soft letters like L, and names ending in -ie or -y usually seem more feminine. 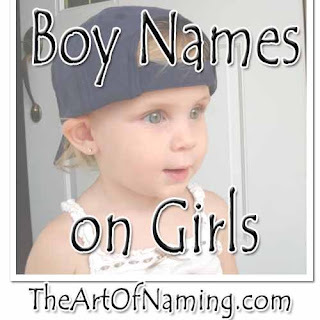 Yet the opposite hardly ever happens, where a boy is given a name that is primarily associated with females. What do you think of this trend? Would you name your daughter Hunter or Levi? Would you name your son Vivian or Evelyn? Do any of the names above need to be switched to a different category? Let me know!